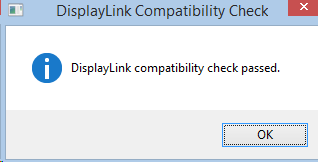 DisplayLink software includes a system compatibility check which will run on your PC before installation. This will make no changes to your system and only checks for potential issues. This compatibility check only runs and is needed on Windows 10 Threshold (2015) and earlier OSes. Windows 10 Anniversary update 2016 introduced a new architecture for USB graphics which eliminates the compatibility checks needed on older versions of Windows. DisplayLink drivers can be installed on any PC running Windows 10 Anniversary Update 2016, as long as it meets the system requirements. No incompatible software drivers installed. Any issues found will be notified with a notification message, with a link for more information, on how to solve the issue. The system compatibility check can be skipped by running setup.exe from a command prompt with the switch -ignoreCompatibility. System compatibility checks can also be disabled during runtime. To disable compatibility checks during runtime, set the registry value HKLM\SOFTWARE\DisplayLink\Core\DisableCompatibilityChecks to yes. DisplayLink offer a stand alone version of the system compatibility check application, which will check if your Windows PC is compatible with DisplayLink software and notify you of any problems found. No incompatible 3rd party USB graphics software is installed. Extract DlCompatCheck.exe from the zip file. Double click the exe to run the check. The check will take a few seconds to run. Any incompatibilities will be notified to the user by a pop up message. If no incompatibilities are found, the user will be shown that all tests pass and the system is compatible with DisplayLink software. The output file is a plain text file. The first line is a header with program version and a date used, followed by any warning or error found along with the message the end user would get. For most error messages, a link for more information is provided. If present, the LargeScreenBoostCapable information line states if the graphics card supports that feature and this report is used when contacting DisplayLink technical support. It can be opened as CSV file, using space as a separator and also mark the option not to separate strings enclosed in quotation marks. - 1 will be returned if at least one test fails. This includes both "warning" and "critical" severity tests not met. The returned value can be used for conditional deployment. For instance, DisplayLink is aware that outdated USB 3.0 host controller drivers containing bugs will give a very poor user experience. and may lead to support calls to the IT department. Therefore it could be useful to test machine suitability and address third party issues before doing a deployment to end users. What is the maximum USB distance a device can be from a PC? How should I undock from a DisplayLink docking station? Which languages are supported by DisplayLink software?